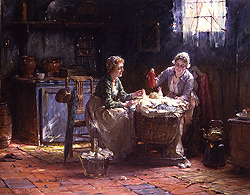 Edward Antoon Portielje, a late nineteenth-, early twentieth-century Belgian painter from Antwerp, showed an interest in seemingly disparate subjects; on the one hand, his images of the domestic woman show a sensitivity toward the female sitter and the encompassing environment, while his depictions of Dutch fisherman suggest a versatility in choice of subject matter and execution. Modern audiences will be more familiar with his works dedicated to the perpetuation of the cult of the female, which romantically look back to eighteenth-century style artists and show glimpses into aspects of daily life. Edward Antoon Portielje, the son of the Dutch artist Jan Frederik Pieter Portielje, primarily a portrait painter, was born on February 8th, 1861 in Antwerp. Edward’s brother, Geerard Jozef, was also an artist in the family tradition. Edward undertook artistic training at École des Beaux-Arts in Antwerp, studying under Charles Verlat, who also taught Van Gogh during the early 1880s. That Portielje and Van Gogh were studying at the same time shows to what point artists diverged during this period. Portielje maintained a refined execution with traditional themes while other artists in Belgium, as in France, began experimenting with other methods of representation. The original School of Art at Antwerp was instituted in the year 1664, mainly by the efforts of David Teniers (the younger) and a number of his contemporaries…At the time of the French Revolution, Art was neglected here as elsewhere for the more momentous questions then disturbing the mind of Europe…but in the year 1804 a new era dawned, and the present Société des Beaux Arts was set on foot, with Herreyns as first director…An old Franciscan monastery was chosen as headquarters, and in this building, slightly altered to suit its new purpose, the work of the Society has been successfully carried on to the present day. The working hours of the Academy average seven a day and punctuality is a feature. Breaches of discipline are punished by giving the offender compulsory holidays for two or three days or sometimes weeks. If the offence be grievous the student is given a congee of indefinite duration, and he adjourns form the Academy sine die. This form of punishment is known as “A la porte” and in it milder forms proves a perfect boon to the lazier members of the student community. No smoking is allowed. Time was when the students might smoke and paint the livelong day; and there is a record that on one occasion the cloud of smoke was so dense and copious that it obscured the model. If the Belgians outdo the French…it would be dependent upon the originality, and the point of departure of the two schools is in the ensemble of their work, still today very visible. Flemish painting possesses a complete technique, and even more a student of the Antwerp Academy paints with a surety and a dexterity that one looks for in vain, not only in Germany, but also amongst many French artists. While nevertheless examining them closer, one notices that this beautiful color is obtained at too great of a price and that it is rather a learned skill more so than the personal sentiments that moves the brush. Precious confession, important observation, explains the new transformation of the school. Such remarks may offer insights into why Portielje was not present at the Parisian Salon, whether by choice or circumstance. 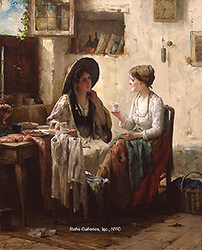 Even though his brother, Geerard, exhibited at the Salon in 1881, 1882, and 1884, Edward instead preferred to send his work to smaller, and more often local, exhibitions such as those found in Antwerp, The Hague, but others in Reims, Namur, Mons, Liege, Sap, Verviers, and Middelburg. Frequently, it is on this small piece that the painter grabs our attention. It is an accessory, or some flower, or a fruit, or a faience piece, a little tender or strong material through which operates the joyous miracle of the light and color. And it is this, in sum, which is the subject of the painting. It is through this that the painter explains himself. So persists, even in the actual disorder of the accelerated and often arbitrary evolution, the indestructible association, of our painters, of our genre painters, of our painters of interiors as well as with our idealists, of the dream and the wonder before reality. While such description can illuminate the many of the eye-catching details of many of Portielje’s pieces, he did also undertake other artistic opportunities outside of canvas painting. In 1894, in collaboration with E. De Jans and J. Dierickx, Portielje painted several wall paintings for the Ghent World Fair. He was also known to have produced panels for the World Fair in Antwerp. Portielje’s contributions to Belgian painting earned him the respected honor of knighthood from the state. He died on December 18th, 1949 in Antwerp. Portielje’s intimate interior scenes, in the artistic lineage of Belgian painter Jean-Baptiste Madou and the most recognizable of Portielje’s image for modern-day audiences, offer light-hearted reflections of leisure time rendered in warm tones that give his images such immensely appealing qualities. His reliance on local exhibitions shows his patriotism to the creation and advancement of typically Belgian art, in both theme and mood. Signed; also stamped with the artist's seal on the reverse.